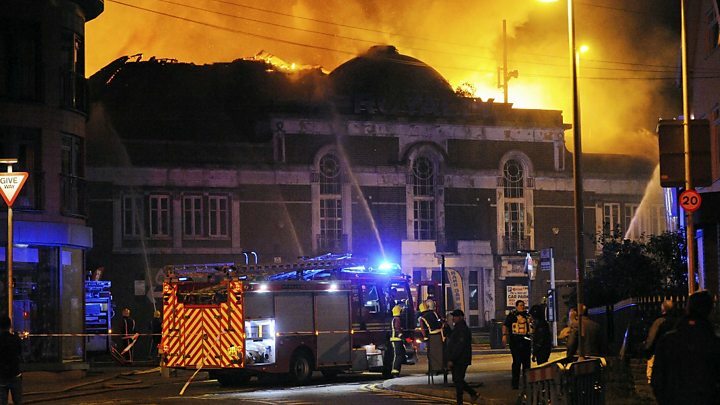 A fire which ripped through an historic former cinema in Birmingham is being treated as arson. West Midlands Fire Service (WMFS) was called to the old Royalty Cinema in Harborne at 00:32 BST and were putting out the fire for eight hours. Smoke and flames were seen billowing from the roof of the building on High Street, which dates from the 1930s. The fire service later confirmed on Twitter that it was treating the fire as "suspicious". Lee Baker, a station commander with WMFS, tweeted earlier that he was "sad to see this art deco building has finally been ruined by arsonists". Up to 50 firefighters tackled the blaze at its height. The service said crews were not able to access parts of the building due to structural damage. West Midlands Police said there were no casualties. Image caption A group which had been looking to bring the cinema back to life said it hoped the "damage is not too extensive"
On Facebook, the group which has been campaigning to restore the building said it was "devastated" to hear about the fire. Rob Sutton, chairman of the Harborne Royalty Trust Board, said the Grade II listed site, which had been closed since 2010, had been used by rough sleepers. But there had been "lots of support" in Harborne for its plans to turn the cinema into a community venue, with a public consultation on the scheme launching last week, he said. "One of the trustees has been down there and we understand the main party of the building has been pretty well gutted," he said. "Renovation is going to be a very difficult challenge now. "But we are very willing to engage with the owner to look at ways we can turn this very sad event into a positive one for Harborne and tap into that massive support.